Usage: In spaces where natural lighting and fresh air circulation are desirable, and an overall bioclimatic architectural approach is required. Operation: At the press of a button, and system’s movable parts are slid upwards and positioned right under the fixed part. Characteristics: Double structural glazing, aluminum frame with thermal break, electromechanical operation. The sliding glazed roof T-GR is our company’s state-of-the-art proposal in the field of glazed roofs. Made of thermally broken aluminum profiles, it can offer absolute protection from any external weather conditions and significantly improve the energy efficiency index of a building. This extraordinarily robust construction can, at the press of a button, offer you all the incomparable benefits of outdoor spaces. Thanks to its innovative design, it aesthetically compliments any space where it is installed, remaining watertight even under heavy rain and windy weather. The sliding glazed roof consists of transverse aluminum bars, on which the system’s glass-boards are positioned. Electrical motors use belts, which slide the moving framed parts upwards, until they are parked into one another, thus freeing up the two thirds of the roof’s surface. The motion of the moving parts is quiet and smooth, thanks to the multiple ball bearing system they employ. The system uses structural glazing, which enables swift water-rain runoff, since the surface is always smooth and unobstructed – offering, apart from the technical advantage, a sensational feeling of crystalline affluence. Countless applications, in both private and public-use types of spaces. The roof’s energy efficient design renders it an ideal solution, even for indoor residential spaces. The T-GR roof also comes with all the necessary specifications for public-use applications, such as schools and hospitals, especially since it can reduce the energy consumption demands in such spaces, whilst significantly contributing to better overall health and mood levels of anyone using the building. Ecological Design : Salinox’s glazed sliding roof is comprised of thermally broken aluminum profiles, which, in combination with structural glazing, very significant savings in energy and maintenance costs can be achieved, considerably impacting the environment as well as a budget. Protection from weather conditions : The T-GR, with its thermally broken aluminum profiles and low-e structural glazing, guarantees conditions ideal thermal comfort in any enclosed space. Healthy environment : Making the best of the available natural lighting improves the users’ quality of life and promotes psychological health. Bringing in fresh, natural air from outside and using it to cool down our living space, is vital for good health – especially since spending increasingly longer amounts of time indoors. Innovative design : The glazed sliding roof system is one of the most important design innovations by Salinox (patent No. 100905200). The transverse aluminum bars which make up the system, are equipped with a smart rainwater runoff system. The system also employs double glass-boards bonded together with a special method to form the so-called “structural glazing”. These two components are coupled together to create an incredibly smooth surface without any grooves or dents, which will perfectly protect the enclosed space from any possibility of inflow – and allow for much easier and cheaper cleaning. Minimalistic aesthetics : Simple and contemporary design, which maximizes the glass surface area of the roof by using structural glazing. 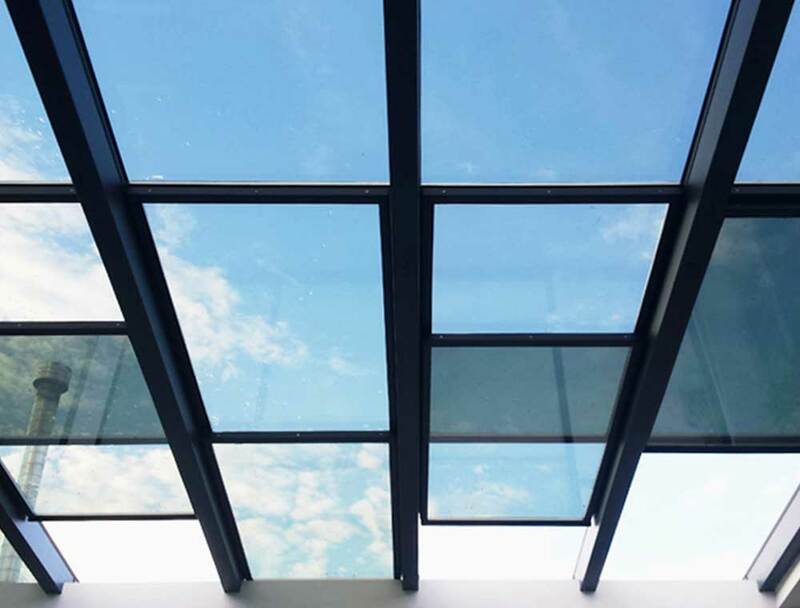 Design flexibility : The sliding glazed roof with thermal breaks TSR can be constructed to any required dimensions of any individual building opening. Depending on the space’s needs, the number of frames and their positioning is determined. There is a choice between making a certain number of panels moveable (sliding) or not – so, for instance, in order to reduce the cost of materials, one can choose to make half the panes moveable, and keep the other half fixed, without affecting the visual harmony of the result.